This A.M. I have a killer recipe for you to make out by the grill. The recipe includes one of my favorite summer foods: pineapple. 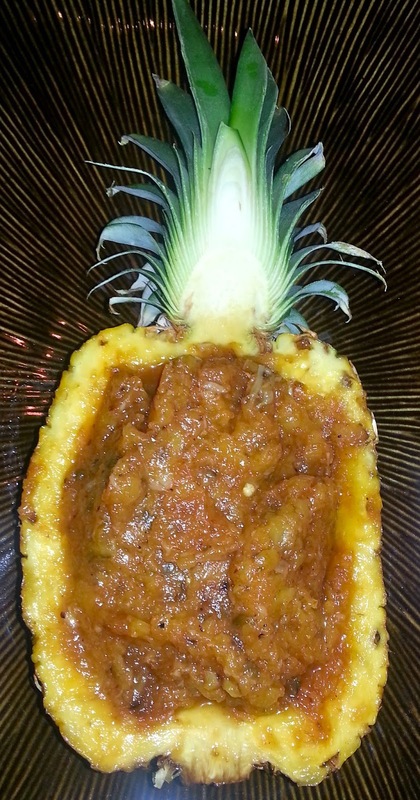 I made a sweet and slightly spicy pineapple chutney that I served in a hollowed out pineapple. We dipped grilled chorizo, poblano pepper and pineapple (extracted carefully when we made the pineapple bowl) along with tortilla chips in the delicious chutney. The real key to this recipe is charring the pineapple to get a nice smoky flavor that really complements the fruit's natural sweetness. Before building skewers to grill, I par cooked the chorizo sausage. I pan fried them until the inside wasn't raw but the outside casing wasn't crispy. This enabled me to slice the chorizo and will allow it to char more quickly later while on the skewers, with out having to wait on them to fully cook and possibly burn the rest of the skewer ingredients to a crisp. 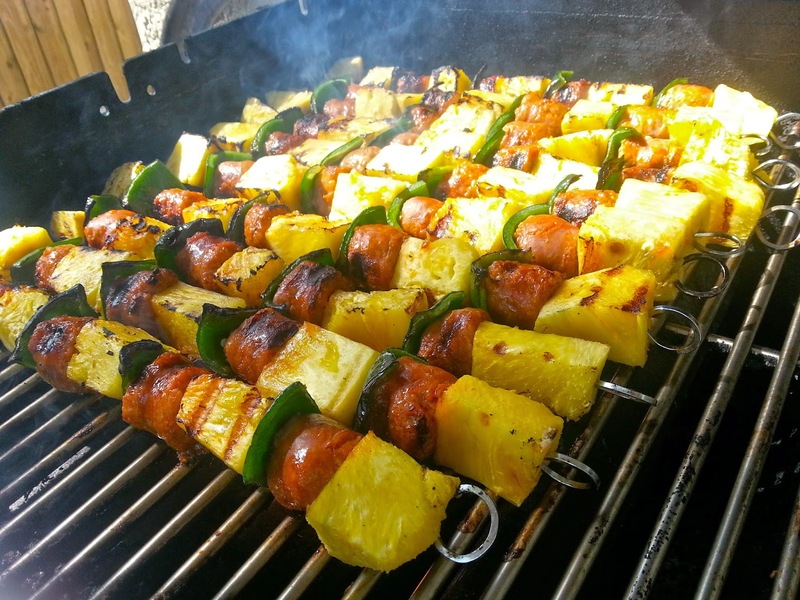 When it was time to build the skewers I kept it simple, no seasoning or marinade, just the chorizo, pineapple and poblano. I use metal skewers but if you are using wood or bamboo I recommend soaking them in water over night. Grill skewers on medium high heat turning as needed, until a nice char has formed. The skewers may look a little burnt if you haven't done this before, but trust me it is so flavorful and delicious. 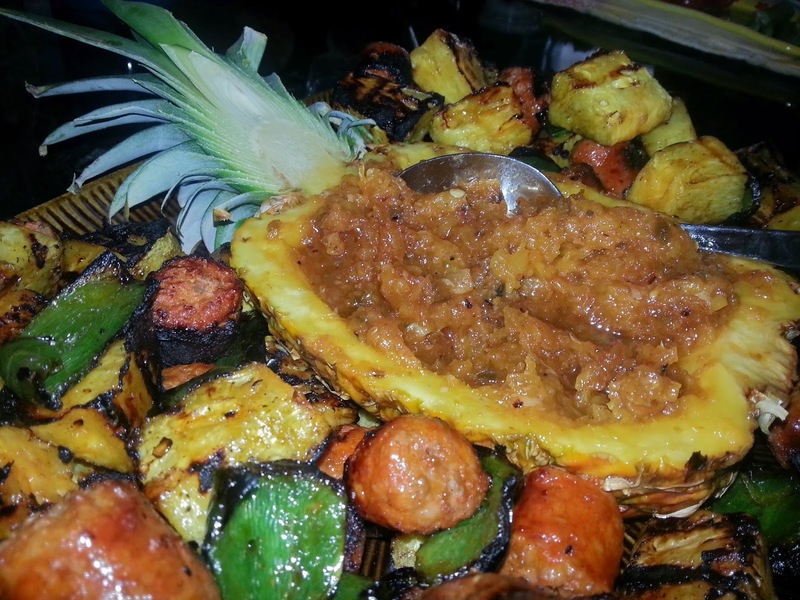 Make the pineapple chutney recipe below earlier in the day and use as a delicious dip for your smoky skewers! Preheat oven to Broil 450. Cut jalapeno in half and remove seeds and stem. On a baking sheet covered with parchment paper, arrange pineapple chunks (reserve juice) and jalapeno. Broil for 10-15 minutes until the pineapple and jalapeno have a little char (this can also be acheived on the grill, but i find it a little quicker and cleaner just doing in the oven). Rough chop the jalapeno, then in a shallow sauce pan, combine all ingredients, including reserved juice and broiled mixture, but not the lime. Bring to a boil. Stir well and reduce heat to simmer for about 45 minutes, stirring occasionally. The liquid should be boiled off and a nice textured chutney will remain. Remove from heat and mix juice from lime in. Cool mixture. 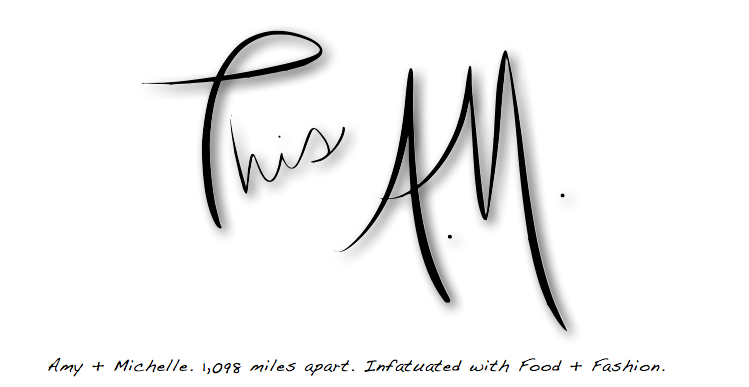 Store in an airtight container, refrigerated, until ready to serve.